In the previous post, the mining careers of brothers, Matthew Grose (1761-1824) and Samuel Grose (1764-1825) were covered. Info was studied in four books containing extracts of their correspondence with William Jenkin (1738-1820). All three men were from Redruth, Cornwall. Jenkin looked after mining interests for the Marquis of Buckingham. He appointed Matthew and Samuel Grose as Mine Captains in Cornwall and Somerset. From Jenkin’s letters, we see Matthew Grose (1761-1824) was Mine Captain at Loxton, on the Mendip Hills in Somerset. Initial research suggested it was a brief, unsuccessful copper mining venture, but Jenkin’s letters show it was a long captaincy. 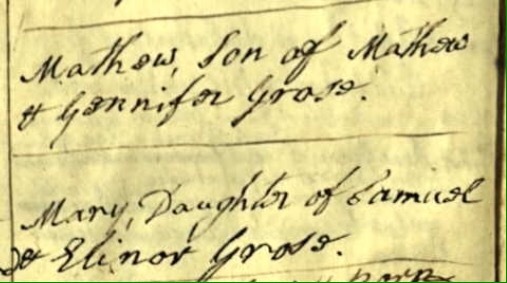 With baptism records missing for two of Matthew Grose’s children – John Grose (1793-1842) and Elizabeth (1797-? ), we can check again for misspelled records – focusing on Loxton and surrounding area. From Jenkin’s letters we know that Matthew Grose (1761-1824) was still in Loxton in 1794. This bodes well for finding John and Elizabeth Grose’s baptism records nearby… unless for some reason they were baptised elsewhere! We know Matthew Grose (1761-1824) was back in Dodington, Somerset by 1820, installing a pumping engine in the Beech Grove House. By 1821, his son, (Matthew Grose, 1788-1849) and daughter-in-law, Mary (nee Wearn) are with him. They baptise their son, Thomas Grose at Dodington, Somerset. Matthew (1788-1849) is listed as a ‘Miner’ on son Thomas’s baptism. Was Matthew working in the Dodington area too, or visiting his bold father, or perhaps en-route to another mine? Work ceased at the Dodington (Buckingham) mine in 1821 and equipment was sold off in 1822. In the 1823 newspapers, at Okehampton, Devon, (approximately 50 miles southwest of Dodington, Somerset), we see a Mine Captain called Matthew Grose at the Sticklepath Copper Mine. Could this be one of our Cornish Mine Captains – either Matthew Grose (1761-1824), or his son ‘Foxdale‘ Matthew Grose (1788-1849)? Near to Sticklepath in Devon are the villages of South Zeal and Belstone. We see Elizabeth Ash (nee Grose) (1797-?) and her miner husband Obadiah Ash in South Zeal around this time because there are baptism records for their children here. eg, Obadiah Ash junior baptised in 1822. The mother on the baptism record Elizabeth Ash (nee Grose) is the daughter of Matthew Grose (1761-1824), so the younger sister of Matthew Grose (1788-1849). On 18th March 1824, we see a baptism in Belstone, Devon for a John Grose, son of Matthew and Mary Grose. Their abode is Sticklepath and the profession of the father is Miner. All this evidence points to the Mine Captain of Sticklepath, Devon being ‘Foxdale’ Matthew Grose (1788-1849). This is just four years before he migrates to the Isle of Man. There is a slim chance that his father is the Mine Captain at Sticklepath, with Matthew just a miner, but unlikely. His father, Matthew (1761-1824), passes away this year in August 1824 and from extracts in “Men & Mining on the Quantocks” (Second Edition, Hamilton & Lawrence, 2008) he stubbornly resided in Dodington, (trying to attract new investors for the Buckingham Mine) and died there in grinding poverty. Was Matthew Grose (1761-1824) alone when he died a pauper in 1824? Were his wife (Jane/Jennifer nee Williams) and youngest daughter, Eliza (1807-1864) still in Somerset at that time too? To be resnearched another time! Only a few gaps remain in the career timelines for the Redruth brothers, Matthew and Samuel Grose. With further analysis of the information from Jenkin’s letters, this will now be easier to research. ‘Foxdale’ Matthew Grose (1788-1849) was a miner at Dodington, Somerset in 1821 because he was baptising his son Thomas Grose (1821-1882) there. This date ties ‘Foxdale’ Matthew to working in Dodington with his bold father, because Matthew Grose (1761-1824) is installing an engine at Beech Grove (and subsequently upsetting the Marquis by moving it to the Glebe House!). Also, from connecting a random newspaper clipping about Sticklepath Copper Mines in Devon to the Grose family, we’ve discovered ‘Foxdale’ Matthew Grose (1788-1849) was likely Mine Captain there by 1823. His abode was Sticklepath and he baptised his son John Grose at nearby Belstone in 1824. Interesting to note that ‘Foxdale’ Matthew Grose (1788-1849) chooses a ‘Church of England’ church to baptise his son, John (1824-1888), in Devon. His sister Elizabeth Ash (nee Grose) (1797-?) chooses the nearby Methodist Church to baptise Obadiah Ash junior (1822-?). The connection between the siblings, Elizabeth Ash (nee Grose) and Matthew Grose, is of particular interest because BOTH migrate to the Isle of Man. This will be looked at more closely in a future post. Unless the Loxton Parish Registers are just too badly worn! Thanks for reading. Please comment or contact if you’re enjoying the blog, or if you have any info or ideas that might help with some of the mysteries! Thanks for reading, Amy! So satisfying to ‘join the dots’ between seemingly random snippets of info. Yes, and that’s both the fun and the challenge of doing this kind of research! I love all the documents you found here. Yes very interesting read. I’m beginning to wonder if our Manx Matthew junior was buried in an unmarked paupers grave at Rushen church, given the fact of his status at that time with the auctioning off of his possessions etc, as I have tried to find him in there on numerous occasions.? Thanks for reading. Agree with you 100%. An unmarked grave at Rushen is currently the strongest possibility – given nothing showing up on the headstones – despite your thorough searching. We now know Rushen is definitely the right church from looking closely at the Curates’ names on his & wife’s burial records. Perhaps we need to look again at which other family members were buried there – at similar time. Could Matthew Grose junior be in same plot, or nearby?